Firstly, lets start with an acknowledgement of a fundamental piece of fibre crafting etiquette, and now lets disregard it. I am frequently asked about the size of my stash. It seems that many of my knitter and non-knitter friends are intrigued and it would seem that they believe I have a whole yarn store tucked away somewhere. Consequently, since my accent isn't that far from Dame Maggie's up there* (I can ramp it up when required), I often repeat the above refrain. However, there comes a time with most knitters/crocheters/fibre craft enthusiasts where we start to feel overwhelmed by the amount of our stash. I have discovered that the tolerance level for each person is as individual as they are. I, for example, have one plastic tub (possibly 80L) which contains my "Good Stuff" and a chest of drawers (that white one in the background of the pic below) where a dump my cheap acrylic and partial skeins. Now the chest of drawers I don't really worry about, I don't tend to buy a lot of acrylic and the partial skeins seem to get used up nicely in colourwork and small knits like socks or contrasting colours for larger pieces. However, when I can't get the lid to fit nicely on the plastic tub I know its time to scale back for a while. While this plastic tub is full, I can not buy anymore nice lovely squishy yarn because then I would have to figure out another storage location. I've never flashed my stash before, here it is. Squish it all together ....Whole nuther story....Also remember this does not include acrylic or partials so yep there is more. Anyway, I have to admit that I need to do something about this and I have decided to be good and attempt to knit from stash for the next year (or until it gets boring or I have room in my stash bucket again…honestly, I’m not that disciplined). I plan to take another picture in a years time to see how much I have managed to chew through. How long do you give me before I fall off the wagon? *Imagine if you will, Kate Winslet and Hugh Jackman spawn a lovechild who spends equal amounts of time in England and Australia, well apparently that's what I sound like. I'm looking forward to seeing what you make from your stash, I almost feel like you could mark up the photo each time, pointing out which bit of the stash is in the project. Is it terrible that I wish I could have been there, to squish them all and hear the stories behind their acquisition?! I particularly like the look of the two different lots of blue-green twisty skein thingies. On Ravelry some people do an annual flashing of stash some of the stashes are amazing and fill entire rooms. The request to come roll in another knitters stash is a fairly common request. 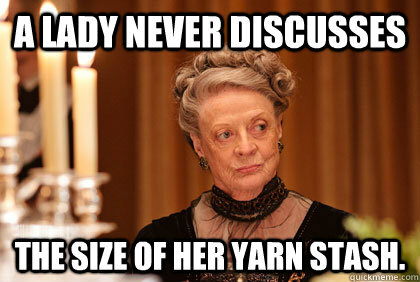 Some of the yarns do have good acquisition stories, some are a little dull. The two lots of blue green twisty things have nice memories and good stories. The two above the pink skein on the top flash pic the one is green sparkle yarn from Bendigo. The other was a gift from my mother-in-law who went into a yarn store in Paris and asked for their greenist yarn, the colourway is called Stephen the Merman. The ones to the right of the dusty pink yarn were from my friend Carson, she was in a charity shop and she saw a massive bag of yarn mini-skeins and realised that they were all samples from Three Irish Girls (purveyors of nice squishy yarn). She pulled all the greens out and sent them to me.